This article is about the football player. For other uses, see Kevin Jones (disambiguation). Kevin Jones during the 2008 NFL season. Kevin S. Jones (born August 21, 1982) is an American former college and professional football player who was a running back in the National Football League (NFL) for six seasons. Jones played college football for Virginia Tech, and earned All-American honors. He was selected in the first round of the 2004 NFL Draft, and played professionally for the Detroit Lions and Chicago Bears of the NFL. Jones was born in Chester, Pennsylvania. He was a standout in football when he came to Cardinal O'Hara High School as a freshman. Coach George Stratts had no choice but to put him in as a freshman. Jones broke many records at O'Hara and capped his high school career off with a Philadelphia Catholic League Championship. He scored four touchdowns in the Championship game. Winner of the Hall Trophy, Jones was the No. 1 overall recruit in the nation, and could not decide between Penn State and Virginia Tech, eventually choosing to be a Hokie to the surprise of many. Jones said, "If you're a blue-chipper from Pennsylvania, you go to Penn State. But I've always been a little contrary. On the day of my press conference, I still hadn't decided between Virginia Tech and PSU. As I sat down in front of everybody, I had both jerseys with me. I pulled the Penn State jersey out of a bag and said, "I will ... not be attending Penn State." Then I ripped off my sweater and had a Mike Vick jersey on underneath. The entire room was flabbergasted." Jones was also an outstanding track and field athlete at Cardinal O'Hara High School. He was a standout in the 60 meters and 100 meters, posting personal bests of 6.79 seconds and 10.59 seconds, respectively. He also competed in long jump, with a personal best leap of 6.92 meters, and triple jump, with a personal best leap of 14.57 meters. Jones attended Virginia Polytechnic Institute and State University, and played for coach Frank Beamer's Virginia Tech Hokies football team from 2000 to 2003. He was the highest rated commitment in the history of the Virginia Tech football program. Following an injury to Lee Suggs, Jones won the starting job and set a school record for rushing yards from a freshman. In 2002, Suggs and Jones split time at tailback, and were together called "The Untouchables" as a result of a fan contest for giving the duo a nickname. Kevin finished his college career with 3,475 yards and 35 touchdowns on 616 carries (an average of 5.6 yards per carry), and 24 receptions for 229 yards (an average of 9.5 yards per reception). His 3,475 rushing yards and 35 touchdowns both rank second on the school's career-record list. 2001: 175 carries for 957 yards (5.47) and 5 TD. 6 catches for 47 yards. 2002: 160 carries for 871 yards (5.44) and 9 TD. 4 catches for 21 yards. 2003: 281 carries for 1647 yards (5.86) and 21 TD. 14 catches for 161 yards. Jones had a successful rookie season with the Lions and became only the third running back in franchise history to rush for 1,000+ yards in his rookie season, joining the ranks of Billy Sims and Hall of Famer Barry Sanders. He was sidelined at the end of the 2006 season with a Lisfranc fracture. Jones, still working himself back from the Lisfranc fracture suffered in 2006, looked impressive early on in the season as the number two back, and saw his first action as a starter in Week 7 against the Tampa Bay Buccaneers. Jones rushed for 105 yards on 23 carries and one touchdown in his second start of the season in a Week 8 victory over the division rival Chicago Bears. In Week 7, Jones became the full-time starter, getting the bulk of the carries for the Lions, with backup T. J. Duckett seeing only limited action. But Jones injured himself again, creating concern about his durability. On March 13, 2008, the Lions released Jones. On July 14, 2008, it was reported that Jones would sign with either the Chicago Bears or the Pittsburgh Steelers. On July 15, 2008, he signed a one-year, $605,000 contract with the Bears. On March 6, 2009, the Chicago Bears agreed to terms with Kevin Jones on a two-year contract worth approximately $3.5 million. The deal includes a $1 million bonus and $2 million in the first season. He was intended to be the primary backup to Matt Forte. On September 3, 2009, Jones was injured during a preseason football game when he was hit out of bounds by Cleveland Browns linebacker Marcus Benard. He was out for the 2009 season with torn ligaments in his left ankle. 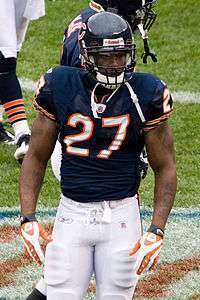 Jones was released on March 9, 2010 after the Bears signed Chester Taylor during the free agency period. Jones returned to Virginia Tech as a student in 2011, to study Industrial design in the College of Architecture and Urban Studies. While interning at a furniture design company in Switzerland, Kevin's boss asked him if he wanted to "go sailing". Jones obliged, expecting "a glass of wine in St. Tropez"; Kevin instead found himself assigned to the position of 'grinder' and the only American among the 22-man crew aboard the 68-foot racing yacht, "Caol ila R." By summer 2014, Jones had worked five races. Jones graduated with a Bachelor's degree in Industrial Design in 2014. In 2014, Virginia Tech hired Jones as "Special Assistant to the Athletic Director". Jones stepped down from the position on June 12, 2016. In 2015, Jones co-founded a design firm in Blacksburg, VA named 'Void Design Haus'. The firm named changed to "JoBa" in 2016. ↑ "Winning Slogan Picked in Contest". hokiesports.com. 2002-08-19. ↑ Cotsonika, Nicholas (2008-03-13). "Lions release Kevin Jones and Kalimba Edwards". Detroit Free Press. Archived from the original on 2008-03-16. Retrieved 2008-03-13. ↑ "Running back Kevin Jones, Chicago Bears to terms". Chicago Tribune. March 6, 2009. ↑ Dickerson, Jeff (March 9, 2010). "Bears release running back Jones". ESPN.com. Retrieved 2010-03-09. ↑ "UFL Personnel Transaction Notice - Sept. 26". 2010-09-26. ↑ "Hartford Colonials Place Two on IR". October 21, 2010. Retrieved October 14, 2016 – via Hartford Colonials News Release. ↑ "Caol ila R". www.mills-design.com. Retrieved February 19, 2016. 1 2 Barber, Mike (July 19, 2014). "Former Virginia Tech RB Jones sails into new career lane". Richmond Times-Dispatch. Retrieved July 20, 2014. ↑ Ranaivo, Yann (December 26, 2015). "Former Tech standout and NFL player Kevin Jones finds new road with design firm". www.roanoke.com. Retrieved February 19, 2016.